“A Novel Idea on Passyunk” proposes to further foster the local literary community. Scrolling through Tinder a few years ago, South Philly resident Alexander Schneider swiped right on particularly quirky candidate. The prospect, Christina Rosso-Schneider, caught the graphic designer’s eye with a peculiar quip about desiring a pet alligator after recently returning from New Orleans. Alexander, though, would soon discover Christina’s witty prose surpassed her dating app bio, as the professional writer dreamt of owning her own bookstore where she’d spotlight not only her own words but the words of others. Three years later, the couple, who was married last month in the Big Easy city, the impetus of their online kismet, is bringing another one of their reveries to life — opening a bookstore, “A Novel Idea on Passyunk,” a compendium of publications — old and new, bestsellers and regional works, which will host a soft opening on Dec. 1. The business, located at 1726 E. Passyunk Avenue, which currently serves as one of the only bookstores in South Philadelphia and the sole store of its kind along the East Passyunk business corridor, is a synthesis of the pair’s passions, as the couple recalls when the idea floated in the ether after it surfaced as a jest last year. As the vision began to crystallize, the duo felt the cornerstone of this new venture lay in shedding light to local writers and presses. While the store, which is currently under renovation after the couple acquired the space in August, expects the arrival of more than 2,000 mainstream books next week from supplier Baker & Taylor, a chunk of titles lining the shelves will be both written and printed around the Greater Philadelphia area. Networking through publishing and writing sources, such as her graduate school, Rosso-Schneider, who recently relocated to South Philly, has steadily acquired a repertoire of regional works from presses such as Lanternfish Press, Empty Set Press, Thirty West Publishing and Split Lip Press. Along with embracing nearby penmen, the business is planning other avenues to cultivate local creativity, encompassing writing workshops, author readings, book clubs and open mic events, a pastime Rosso-Schneider has been running for the past year at the Lucky 13 Pub on 13th and Passyunk. The business already has a writing workshop planned for the spring with Blue Stoop, a local literary hub, whose mission is to “support and nurture writers and readers from all walks of life who live in greater Philadelphia.” Starting in mid-January, the organization will host an eight-week workshop at the space, including poetry, advanced fiction and food writing classes. While “A Novel Idea on Passyunk” is in its infancy, both inventories and activities will remain relatively broad, as ideally the store will evolve based upon the community’s desires. Considering ever-changing transitions of the immediate neighborhood, including influxes of immigrant and millennial populations, the couple intends to trim and add inventory as the business gains momentum. The couple stresses “A Novel Idea on Passyunk” aims to sell an experience more than anything. Aside from featuring literature, the store will hang and sell the works of visual artists on its white gallery-like walls and sell local handmade products, such as bath bombs and candles. 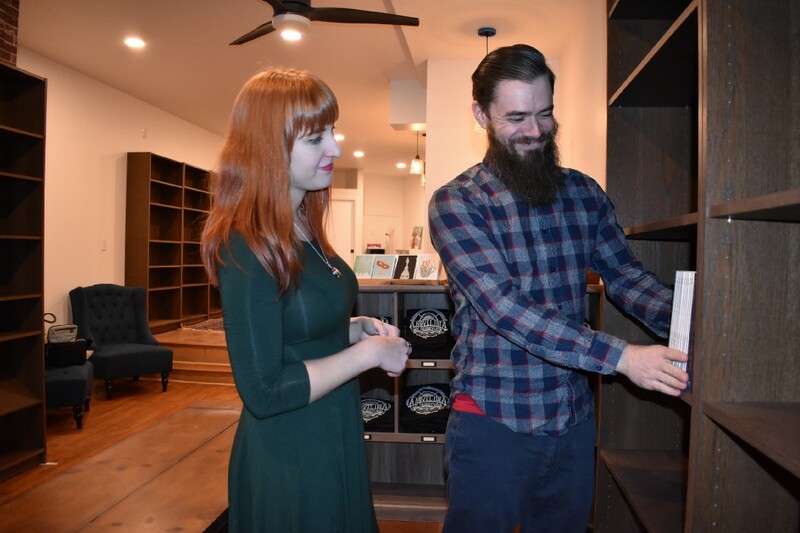 Surrounded by shelves of books and canvases of paint, the store also proposes to host other occasions by partnering with neighboring businesses, planning events such as animal-shelter fundraisers, yoga classes, magic shows or even bone readings — a form of divination which the couple says predicted their success. Anyone interested in planning such partnership is encouraged to reach out to the couple. But, above all, they’re continuing to seek local writers to be featured in the shop, as they’ve established an Google form which applicants can submit online. Info: “A Novel Idea on Passyunk” is looking for local authors with books/collections who want to be featured in the shop. Interested authors can fill out a form at (https://goo.gl/forms/2ynVBfndYc4eVCMX2). Also, the business is open to events, so if anyone is interested in hosting or has suggestions, they can fill out our events form here (https://goo.gl/forms/IpFhTF3sKieLf4Nt1). Dec. 1 is a soft opening date and will feature baked goods all day, and starting at 5 p.m., there will be a a happy hour with complimentary wine, beer and snacks. The couple is planning for the store to be open just weekends through the end of the year, and then, starting Jan. 2, they will be open six days a week. They will have a grand opening the first weekend of January.